Inclusions: Stainless steel fridge, stove, built-in dishwasher, high quality front loading washer & dryer, window coverings, electric light fixtures. Exclusions: Light fixture over dining table. 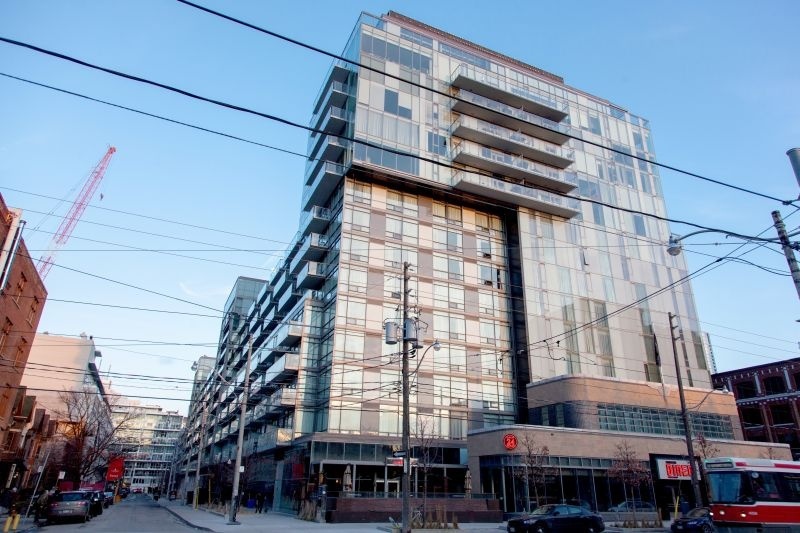 55 Stewart is the pinnacle of an upscale condo & community in central King West! A truly happy vibe and place to call home with incredible quality of life & amenities in one outstanding environment! Pet friendly building. 24 Hr concierge. All hotel perks available including room service & housekeeping. Walking distance to EVERYTHING! Financial District, shopping, sports/arena events, fabulous restaurants, Liberty Village, Queen West & the waterfront. 2 bedroom split plan layout + large den -- over 1200 SF. High end finishes, quality appliances & designer fixtures throughout. South facing floor to ceiling windows -- 2 walk outs to balcony. Ownership of an underground parking spot and storage locker! Inclusive maintenance fees allow you worry free budgeting. Amazing combination of location, cutting edge suite and value for professionals, couples, young families or downsizers! Hip Central King West Location! Relish in Toronto's cultural & entertainment comforts , including parks, theatres, galleries, bistros & retail. Walk to work or easy access to streetcar. Often compared to the "Soho" neighbourhood in New York! King West offers convenient access to Toronto's business, financial & entertainment districts! Easy access to Toronto's Island airport! Popular with young professionals who desire an urban lifestyle close to their downtown offices and effortless walk to most everyday necessities including quality grocery stores. Plenty of parks and green spaces! Beautiful Victoria Memorial Park, Martin Goodman trail, Saint Andrew's Playground, Stanley Park and Trinity Bellwoods Park! Nearby recreational landmarks such as, ACC, Rogers Centre (Skydome), Exhibition Place, Ontario Place, Old Fort York, Harbourfront, and the Toronto Islands. Chosen as the host neighbourhood for TIFF (Toronto International Film Festival) each September! Known for a flourishing nightlife with some of the hottest restaurants, bars/lounges and shopping as well as numerous art galleries , studios, live theatre & musicals along King Street! Go green -- No car needed here. Lots of TTC and public transit routes including bus lines on Bathurst and 24 hour King St. streetcar. Eco-option is an easy walk or bike ride to your downtown destination. By car mere minutes to the Gardiner, QEW, DVP, Hwy 427 to Pearson Airport. Welcome inside this luxurious designer suite! Enter the foyer into double front hall closet. Enjoy the engineered hardwood floors & many extended height doors throughout. The den is big enough to be a 3rd bedroom/guest bedroom or ideal home office , nicely tucked away from the rest of the suite for a quiet working environment. The 4 piece bath located off the den is adjacent to the second bedroom and smart placement for visiting guests. Deep soaker tub! The spacious open concept living & full dining area is meant for entertaining or relaxing with friends. Fits large dining set plus full size sectional in living room. High 9' exposed concrete ceilings. Floor to ceiling windows provide natural light. Gorgeous custom decorated textured wall in dining room. Sliding glass doors walk out to the balcony. Modern Poggen Pohl German kitchen will excite the gourmet. Soft close drawers , ample cupboard space with "flat panel" kitchen cabinetry, Centre Island and breakfast bar with thick square edge corian countertops, high end stainless steel appliances , designer backsplash and stainless steel under-mounted sink. King sized master! Walk-in closet with built-ins. Walk-out to balcony. 5 piece luxurious ensuite bath! Upgraded 12x24 porcelain tiled floors. Glass enclosed separate shower with corian shower tray & drying platform. Separate soaker tub. Custom vanity with contemporary ceramic countertop and integrated sink, upgraded polished chrome fixtures. The second bedroom is amazingly large , conveniently located on the opposite side of the suite with privacy from the master bedroom. Semi-translucent sliding doors, double closets. Laundry/storage room has high quality front loading washer/dryer; porcelain tiled floors. The private south facing balcony has outdoor lighting, clear glass and aluminum handrails. Great extension of outdoor living space in the warm spring and summer months! Barbeques allowed! A unique and indispensable lifestyle of deluxe accommodations with 5 star amenities -- all hotel amenities available to the condo residences! Extravagant building amenities! 24 hour concierge & services, gym, business lounge, yoga studio, visitor parking, hotel amenities including the spa, rooftop infinity pool with a sky bar & lounge overlooking the cityscape! Pet friendly, well run building with excellent property management! Built in 2010 Freed Developments joined the Thompson Hotel group to create a new urban trend called hotel-inspired living offering its residents world-renowned services. Architecture by Saucier + Perrotte Architects! Landscape design by gh3. A LEED (Leadership in Energy and Environmental Design) registered building. Marvel the epitome of the architectural imagination embellished with innovative features , meticulous details, the finest finishes, and undeniable uniqueness throughout , all brought together behind a striking glass facade! Internal landscaped courtyard with a mid-block pedestrian connection from King to Stewart Street. Combination offers quality lifestyle -- where home, work and play all meet.